Claim: Obama has raised the debt more than all previous presidents combined. Variation: Obama has spent more than all previous presidents combined. Fact: The second claim is absurdly false since it attributes rising debt to spending as opposed to lowered revenues (the real cause). This first claim is almost “true” if you start the clock at the beginning of President Bush’s last year in office, as opposed to when he left office (or more properly, starting the clock at the beginning of 2010, since the first budget under President Obama would have been set in October of 2009) AND attribute all causes of debt increases to a president’s actions, as opposed to things (s)he can’t control (like inherited recessions, wars and tax cuts). 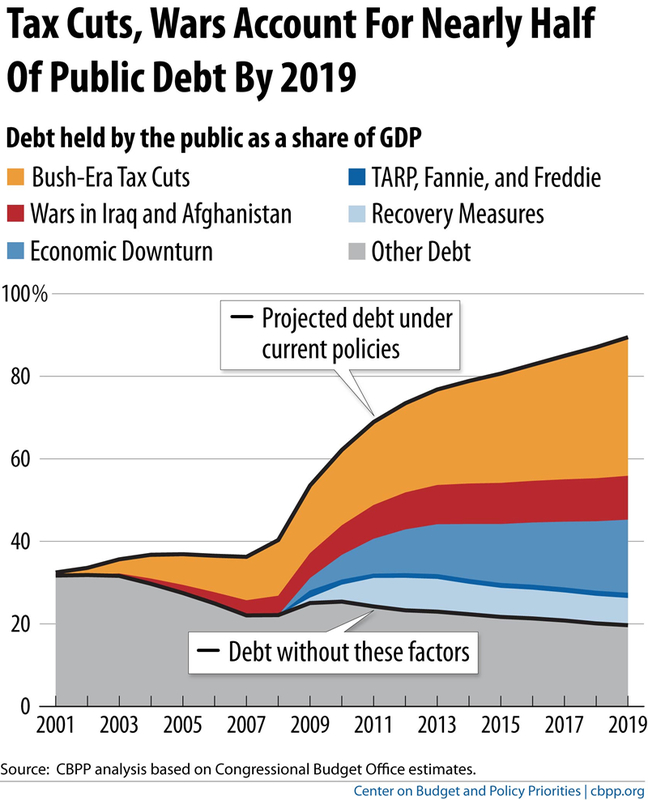 In reality, the fiscal year begins the year prior, and the rising debt has mostly to due with lowered revenues from tax cuts and the 2008 recession, as opposed to increased spending. The claim also avoids any adjustment for inflation or GDP, which any honest comparison would do. Did Obama outspend and/or increase the debt more than all previous presidents combined? The claim that Obama spent more (or at least increased the debt) more than all previous presidents combined requires several false assumptions and omissions. 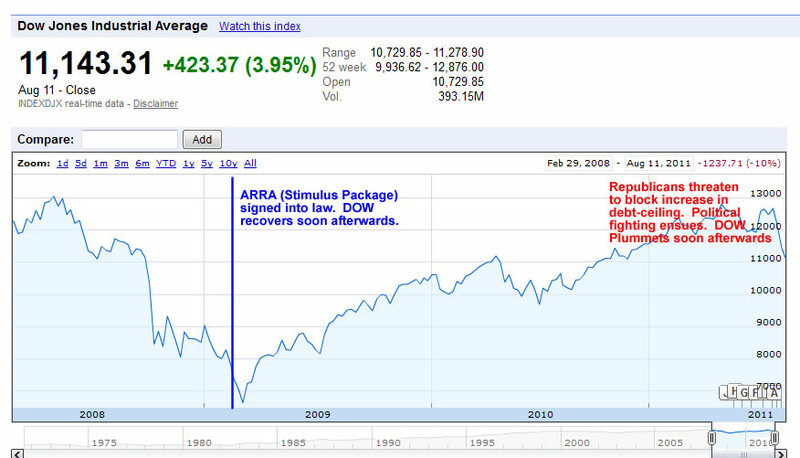 The Financial crisis of 2007–2008 was followed by the greatest recession since the Great Depression. Combined with tax cuts from years prior, these lowered revenues would account for the bulk of the growing debt and deficit. Using the “household budget” analogy, this is analogous to going into debt due to a pay cut or a lost job, as opposed to an increase in spending. In order to claim that debt (or spending) doubled and outpaced the rise under all previous presidents, those making this claim are subtracting the national debt in January 2008 ($10 Trillion) from the national debt in January 2016 ($19 Trillion). 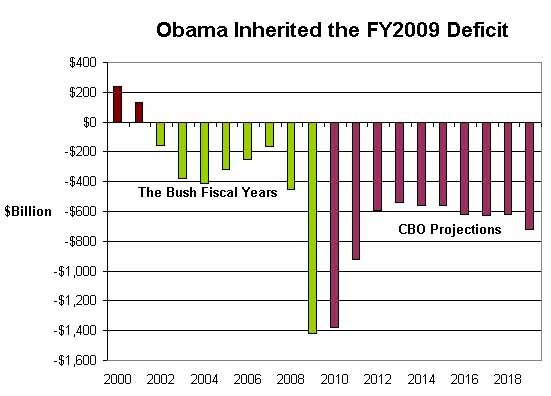 This not only attributes the rise in debt during 2008 (the last year of the Bush administration), it ignores the fact that the the 2009 budget was set in October of 2008, under the Bush administration. The proper comparison would be to compare the debt as measured in January 2010 ($13.5 Trillion) to January 2017 (TBA). The posted debt would have to reach $27T in order for the claim to be true. Since the economy grows and the dollar loses value over time, comparing the debt without adjusting for this is highly misleading. For example, $10 in 2008, adjusted for inflation, is worth $14 in 2017 (so the $10T debt in 2008 would amount to $14T in 2017 dollars. Therefore, it makes no sense to compare in raw numbers in this manner. Also important to factor is the growing economy. Returning to our 2008-2016 comparison, we can see that, despite the recession that resulted in a temporary GDP decrease in 2009, overall GDP grew from $14.7T in 2008 to $18.5 T in 2016. This is why economists generally refer to federal debt (or spending) as a percentage of GDP when comparing this measurement over time, not in raw numbers. 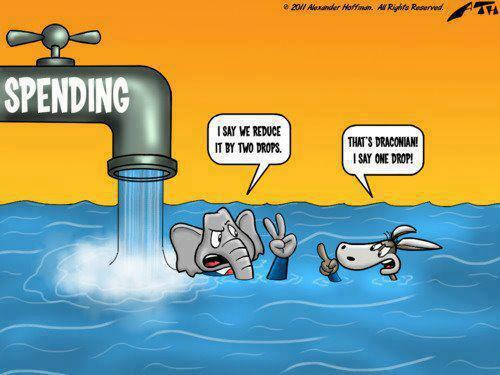 Adjusting for GDP gives a more accurate picture. Furthermore, when comparing spending over time, it becomes clear that the alleged “out of control spending” is hardly in evidence. 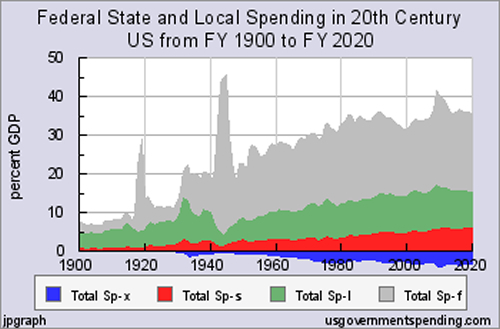 In fact, when comparing to GDP, federal spending was by and far at its highest during WWII. The irony of this claim is that, while it’s intended to pin Obama as a fiscally-irresponsible President who spent the US economy into oblivion, the deficit was actually reduced during his time in office (meaning the government was generating more revenue than it was spending). Furthermore, the accusation of one President accruing more debt than all prior presidents combined is technically true if made of President George W Bush. The US National debt was $5.7T and $11.9T in 2001 and 2009 respectively. Unfortunately, it’s much easier to toss around claims like “Obama outspent all presidents before him combined” than to accurately clean up the mess. Since the average person doesn’t deal with these numbers and rarely has time to unpack claims like these, misleading claims such as these are easily spread. This is especially true since these arguments often prey on our intuition, which tends to be wired more for tangible objects, as opposed to abstract concepts like federal spending as a percentage of GDP.